This is an interesting stone found by the turn off for Brassington Village on the Wirksworth to Ashbourne road that passes Carsington Water. 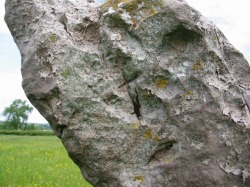 In the Derbyshire Archaeological Journal of 1919 it was spoke of as a menhir in relation to the Bradstone at Wirksworth and a stone at Bradbourne and suggests it to be of possible prehistoric origin. Pointing to the carving of a crucifix as an attempt at christianisation of an ancient stone. 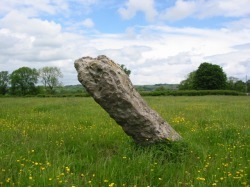 However in the Dodds' book on ancient trackways they note the stone's position as being on the route of the Saxon Old Portway. The stones location heralding the start of the traverse of the high limestone plateau of the White Peak, the crucifix a talisman for the traveller about to make the journey. A later 18th Century stands nearby at the house by the junction. It may be possible that the cross was something to do with a Rogationtide preambulation of the Brassington Parish standing as it does on parish boundary. Below: The crucifix caved onto the stone.